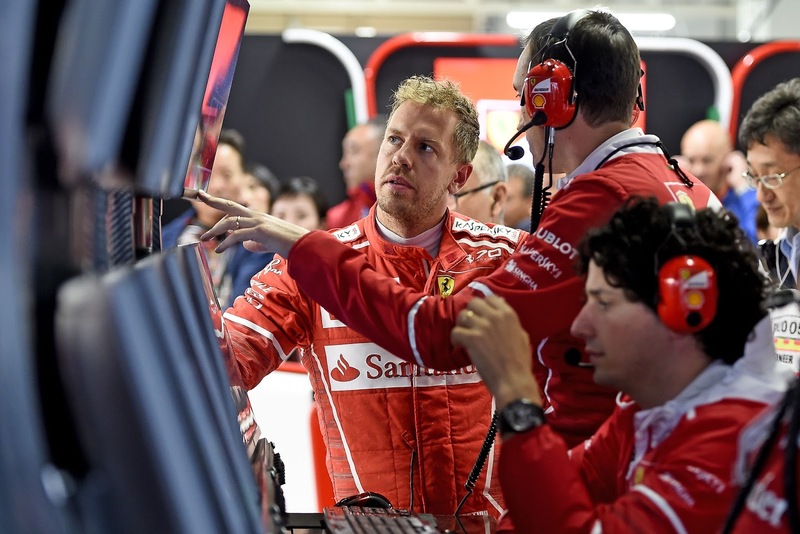 14 minutes to go and once again, Ferrari had the engine cover off, working frantically on Vettel's car, while Hamilton had complained of overheating tyres on his recce lap. Status Quo then as Ferrari carry on disappointing their fans. Spark plug this time and they supposedly sorted prior to the formation lap, but with the acid test looming the uncertainty would not be a friend to Vettel. Along with Jolyon Palmer, Geoff Symmonds was out the door, but more happily for him on his way to HAAS after a lengthy stint at Enstone. 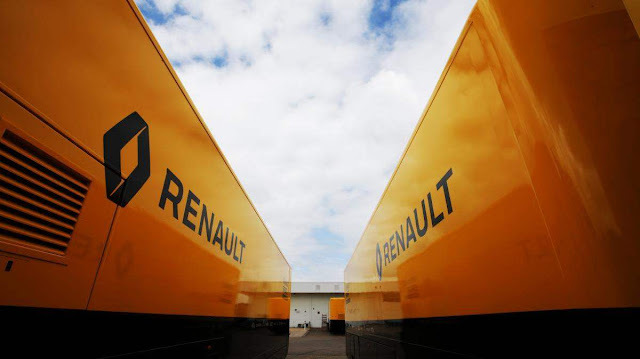 Of course, the paddock shattering news is that Budkowski, to the surprise of no one, was landing at Renault, along with his cranium full of secrets. Also grist for the rumour mill was the news that Gasly would be required to run Super Formula, leaving Toro Rosso in search of a driver for the US Grand Prix. Macca were full of bitter resentment at the oil burning situation, clamoring for action from Whiting and the FIA behind the scenes, though if Renault get on top of it, perhaps their tune will change. Vettel next to Hamilton with Bottas, Raikkonen, Ericsson, Wehrlein, Palmer and Sainz on the Softs contra the rest of the field as they rolled gently off the grid for the formation lap. Raikkonen pitted as the drama at the front unfolded, out in front of Ocon and off in search of Hulkenberg he went. Optimal strategy would see Bottas in around lap 31 and Mercedes did not disappoint, calling Valterri in for his Supers right on schedule and having left a fairly decent dent in Verstappen's strategy. With the gap out to 3 seconds the race was back into Hamilton's hands, with Red Bull playing the waiting game to see if Mercedes could manage its tyres to the end. Much like Stroll, Felipe was being annoyingly fast where it mattered, which was setting up nicely for some fireworks at the end of the race. Hulkenberg finally came in from P8 on lap 39 as Perez hopped on the radio to ask if he can attack his teammate, saying he was "too slow". A cheery "No" was the instant reply from the pitwall, with further updates promised in a couple of laps. The Hulk was out behind Gasly and made short work of him on his new Supers and then tragedy struck, his DRS failed close. 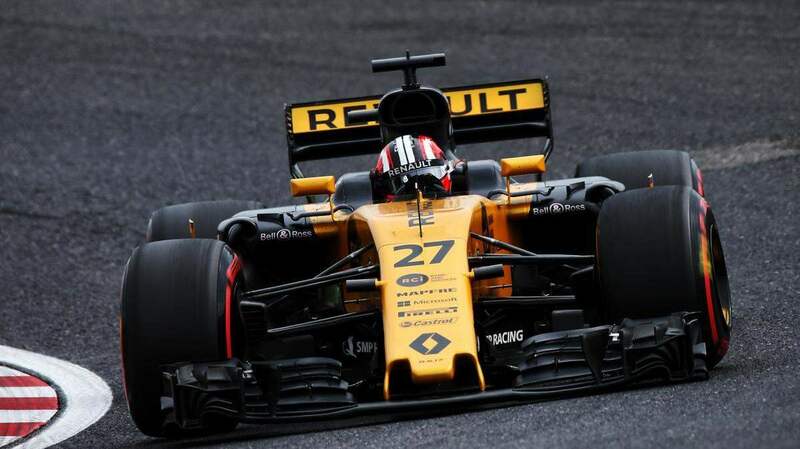 Palmer was in and out as was Gasly leaving them P12 and P13 as Hulkenberg was in to have his DRS sorted. But even the big hammer wasn't enough to get it closed and as the mechanics bashed away it became apparent the upper element was loose and that was the end of his day. Magnussen finally and ruthlessly forced his way through the door Massa left open, despite Felipe's attempt to shut it a bit too late. That left him wide open for Grosjean who sailed by as they ascended into the esses. Alonso was next up to have a go, with about 3 seconds to cover and 9 laps to get it done. At the front, the gap was virtually identical between Hamilton and Verstappen. 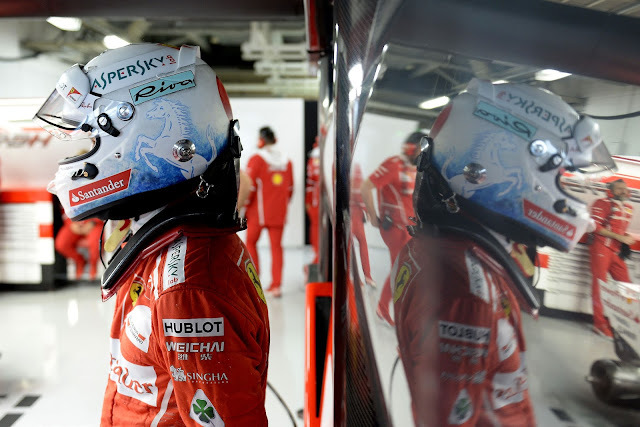 Hilariously, Raikkonen was told he could push on lap 46 as he was staring into the infinite void of a 19 second gap to Bottas ahead. 2 laps later and it was into the gravel for Stroll and out, almost sideways into Ricciardo. Stroll pulled it over and on replay it was a failure on the car and he retired, bringing out the VSC lap 48 and spoiling everyone's fun. Right front suspension or tyre looked to be the offending part as Stroll waved to the crowd and exited the circuit. 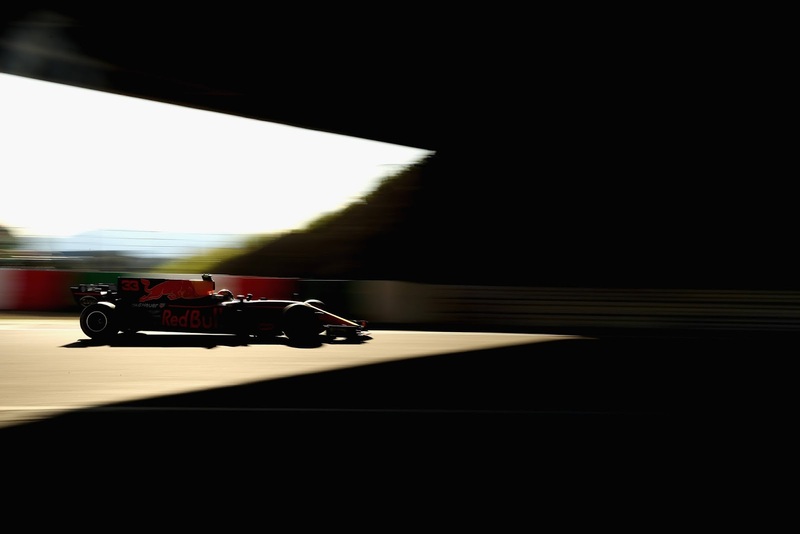 Lap 50 and the racing got underway, and the time warping effects of the VSC were immediately apparent as the gap which Verstappen had closed to 2.4 seconds, had gone right back out to 3.5 seconds. At the other end of the points, Alonso had worked his witchcraft and was within DRS on Massa with 3 laps to go. 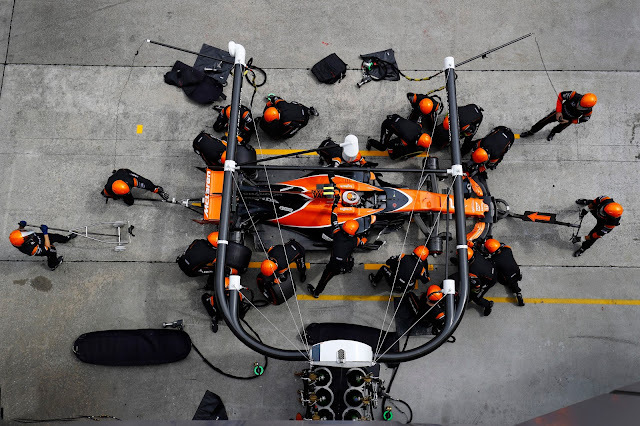 Perez continued to complain about Ocon, to the polite diffidence of the pit wall, Sergio's irony meter apparently still not working. And then lap 51 brought all the drama as Hamilton was suddenly and disastrously 2 seconds slower than Verstappen and it was game on. Lap 52 and it was into DRS for young Max, the ailing Mercedes in his sight. Bottas had caught up with Ricciardo and was having a go as well. Lifesaver for Hamilton was traffic, with Alonso buying him a bit of a gap, and then DRS as well as he caught Massa at a very fortuitous moment. 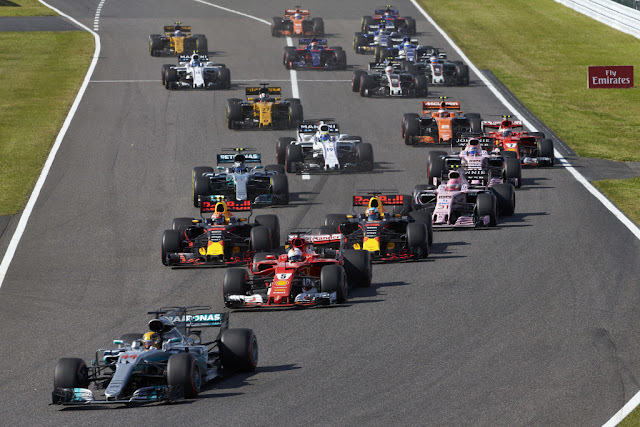 Nervy moments for the championship leader but leading the way into the esses with Massa sandwiched between them had won the race for Hamilton and he crossed the line 1.5 seconds up. 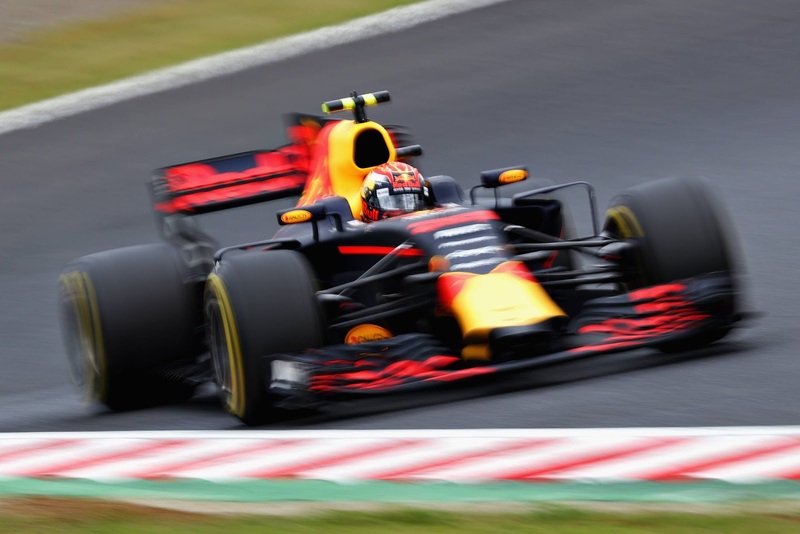 Behind, Ricciardo's stout defense assured him of the final points paying position and it was job done for Bottas, nice recovery and team job done as well. On the inlap it was Hamilton on the radio, reporting vibrations from the PU after shifts as the issue that very nearly turned his dream afternoon into a nightmare. Further back, Massa had held off the charging Alonso for the final point to very effectively ruin Honda's day as it was also announced that Fernando was under investigation for ignoring blue flags. Raikkonen's race finished a lonely 5th, with Ocon just behind and the ever complaining Perez forced to endure the indignity of finishing behind his teammate, whom he's very sure he's faster than. Speculation will inevitably fall on Hamilton's gearbox, especially in light of the fact that Bottas had his replaced prior to the race, but given the retirement of Vettel that will certainly be a trade Mercedes is happy to make. Confusing the issue, Lauda issued the dictum post race that it was tyres, not PU that caused the vibrations, but Lauda's error rate is high enough that it's best to wait from confirmation from the boffins. Crushing blow to the championship, with Ferrari in the end unable to get on top of their reliability issues when the pressure was on, and a great disappointment to those who were looking for the WDC to go to the final race. As a fan of Pérez, it's disappointing to watch him slowly being outclassed by Ocon. This will condemn him to the midfield along with Hulk. Even Robert sees Ocon at Mercedes in a couple of years.